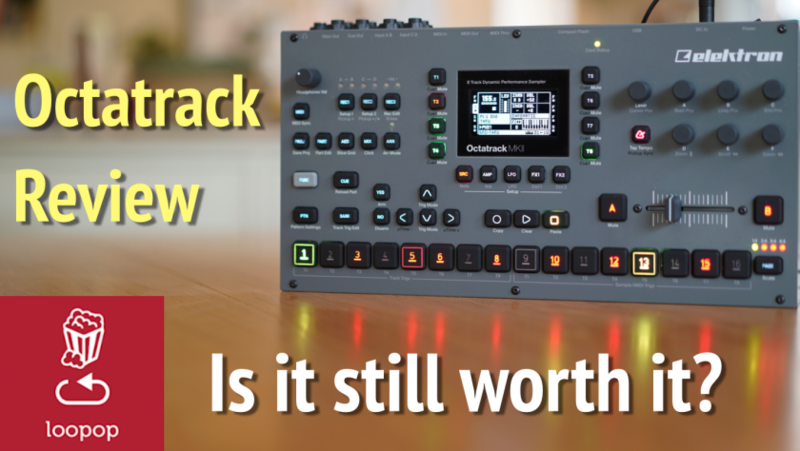 With plenty of upgrades and 8 years after it was released, is the Octatrack still worth it? This review attempts to find out, in light of a few other instruments that have come since then. It’s split up into two parts, first, the top 10 features I think still make it stand out, and then a deeper look at what the user experience “cost” is in terms of complexity. Live sampling: in most samplers, sampling is an offline process. You can’t sample/slide/edit samples when a sequence is running. With Octatrack, live sampling, resampling and looping capabilities are baked in the workflow. Audio Inputs and outputs: Octatrack has four mono (or two stereo) inputs and outputs. On the input side this means you can feed multiple instruments into it for sampling purposes or for applying effects. On the output side you can use one of the two output pairs for cueing audio, or use all four outputs to create quadraphonic mixes. Crossfader: The Octatrack’s slider lets you transition between any two of 16 concurrently available scenes. Scenes contain individual settings for multiple different parameters (track levels, filter cutoffs, LFO speeds and depth, etc). Time/Pitch independence: Most samplers will let you re-pitch samples, but that will come with a limitation of longer playback time as you pitch samples down and a shorter playback time as you pitch them up. It’s much more difficult computationally to decouple the two. Octatrack has two different time-stretching algorithms, and does a fairly good job multiple semi-tone transpositions up and down. Sample slicing: Octatrack contains a comprehensive sample editor with multiple “software-like” features including detecting cross over points, automatic slicing capabilites and more. Octatrack’s “Plays free” mode lets you detach its sequences from the main sequencer and run them with arbitrary start points, regardless of whether the main sequence is running or not. Audio streaming: Aside from playing samples from its own 85MB RAM, Octatrack lets you stream virtually unlimited files from a Compact Flash card (up to 2GB per file). LFO designer: Alongside the typical LFO shapes you’d expect (saw, triangle, etc), Octatrack has a custom LFO designer capable of creating motion sequences of up to 16 steps, with either hard or smoothed transitions between the steps. Built-in FX: Octatrack has numerous selectable built in effects that can be applied to its tracks or incoming audio. Two effect can be used on each track. The “Elektron Workflow”: all of Octatracks features are packaged and presented with Elektron’s unique way of doing things, including parameter locks and conditional trigs. The flipside of flexibility is complexity – so the biggest question is, how easy or difficult is it to get at all those nifty features. These are perhaps best demonstrated in the companion video, so I won’t repeat them here in writing. Overall, concepts covered include the different types of track machines, what recorders and their buffers do, how parts and banks work, and what are the different trig key modes. Thanks for the octatrack video. You reference a companion video that is more detailed. Where might this be found?